What did you think of Bachelorette? After watching the trailer for this a few weeks back, I couldn’t wait to see it. The red band trailer is hilarious, and it’s no secret that I have a mega crush on Lizza Caplan. So I was pleased to see that I could rent this before it’s available in the theater, thanks to my awesome AppleTV! Sadly, that’s where the happiness ends. 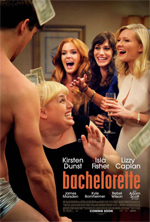 People are going to make the obvious comparison to Bridesmaids since this is a written-by/directed-by a woman film which has to do with bridesmaids and weddings and the high-jinx that ensures there. Don’t get me wrong, I didn’t care for Bridesmaids either. It was one of those films, for me, that just didn’t live up to the hype. Bachelorette. Do I call it flat out terrible? No. That’d be an insult to the word terrible. It’s just so not funny that it was almost painful to sit through. And that’s horrible because, like I said, the trailer is actually quite hilarious. Though I suppose once you’ve seen those funny bits from the trailer once, they’re not really funny a second time. And that was the case for me, I already knew those jokes were coming, so I couldn’t think they were funny again. I’ll admit that there were a few unexpected “ha”s here and there. Certainly not laughing uncontrollable (like I do every single time I watch Mallrats), and nothing to write home about. I really wanted to like this movie. I wanted to be able to have another go-to chick comedy that I can put on as background noise when I’m working, and just laugh to myself as I repeat all the lines in my head. Sadly, Bachelorette isn’t it. I could go on, writing thousands more words about why it’s unfunny, and why I didn’t enjoy it. But I’ll spare you that time of your life. Skip this unfunny, boring, and uninventive movie. If you want to laugh, seek laughs elsewhere.